The upgraded hardwood floors grace the entry of this wonderful valley home. The living room opens to a private courtyard for enjoying the quiet tropical evenings and entertaining with friends. The spacious bedrooms and the office nook are located upstairs and the entertainment areas and kitchen are downstairs. 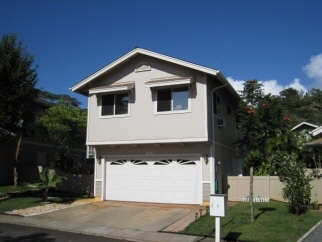 Launani Valley is considered to have some of the nicest amenities in all of Mililani. Private tennis courts, playgrounds and recreation areas just to name a few. There is room for extra parking in front of the garage and there are several convenient guest stalls.